If you are thinking about installing a new garage door soon, you may be eager to learn more about the different models and brands. Amarr is one of the fastest-growing manufacturers of doors for residential garages. The brand offers a wide selection of steel units plus wood, aluminum, and even vinyl models. 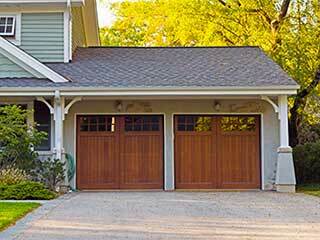 In our opinion, they've always been an innovator when it comes to garage doors. That is not to say that Amarr doors aren't practical. On the contrary, their doors are easy to install and to maintain with the right professional support. The Trento collection is all about introducing new technological innovations that are built into the Amarr garage doors. Interestingly, the brand has not forgotten its roots as a no-nonsense creator of accessories that work efficiently. The Amarr suite provides one of the widest ranges of garage doors. You can opt for wood, steel, combination, or faux finishes. There are traditional, contemporary, and futuristic styles to select from and each of the items is kitted out with the latest technology. The specialty class allows you to customize the installation depending on what you are looking for in terms of security, practicality, and style. This means that you are always in charge of the product. Care for the surface will be as according to the instructions that come with the product, but our technicians can also help with this. For example, fiberglass doors must be protected from shocks and abrasions whereas wood has to be treated in order to reduce the risk of rot. If you have an Amarr product already or are looking for a replacement, we fully understand how to look after any model from the range. We can help you out with repairs, maintenance, and new door installation - just get in touch with Garage Door San Jose today!